This morning I have the opportunity of writing you a few lines and I am glad to say that I am tolerable well and would be glad to know that you are all well. I want to hear from you the worst I ever did. I have got no letter from you yet and I think the time long to get one and I do want you to write as soon and often as you can. I would not have wrote till next Tuesday but times seem very gloomy here and I did not know but this would be as good a time as I ever would get for we are looking for a fight every hour and we are making ready for it but we have heard so many different reports about it that I have begun to conclude that there is nothing of it but the last report we got was that the Yankees was in 20 miles of us with a force of 2500 men. We got that news last night and the regiment was in pretty smart sturup but all seems calm this morning and all that is not sick seems in good heart and that is not very many. There is a power of sickness in the regiment and 5 or 6 have died since I came here and I don't think there is more than a half dozen well men in our company. Bill Parker and Pose and Riley is down sick and a heep others. If nothing else kills us the flees and lice will when the weather gets a little warmer. There is plenty of lice here now. I sent some of my things home by Steven Potts and told him to lodge them at the post office in Franklin. I sent a pair of britches and a coat and a shirt and a pair of drawers and my pocket handkerchief and some shot and cartridge all in a knapsack and I want them got home as soon as they can be after they get there. They will be two weeks or more on the road and if they get wet they will mold and rot. I paid Potts one dollar a 65 cents for hauling them. There was a bad accident happened here yesterday. The artillery men was practicing with their cannon and Lieut. Ferguson had been out on picket guard with some men and coming back and the bum shell fell in a hundred and fifty yards of Ferguson and busted and a small piece of shell struck him on the head and killed him instantly. It took half his head off. He was the worst looking sight I ever saw. I never want to see the like anymore. They picked up all of his brains that they could get and carried them in his hat till they got to camp and dressed his head and put them back. He was second Lieut. company A.
I am tolerable well today. Everything seems quiet here today. We have heard nothing from the Yankees only that they got in 20 or 25 miles of us and heard that we was ready for them and they turned back and it was a wise plan in them. When I was writting what I had sent home by S. Potts I forgot to say that I sent a blanket. I got my blanket that I thought was stolen. It was taken through a mistake. If you get this letter before Wallis Watts starts to camp, I want you if you can to send me a vile of ink for I can't get any here. Times is no better about eating and I will not stay here many weeks longer if they don't get better and you may depend on that for I won't be a dog and niger and perish to death too. I will do better or worse and I can't do any worse than I am doing now. So I think I have wrote enough without I had some news to write and I ain't got any. I want you to write to me as soon as you can for I want to hear from you but I want to see you worse than I want to hear from you and if I live, if times don't get better I will see you sooner than some people thinks I will. Ump and Riley sends their respects to you. Ump is very bad off. Bill Parker is better. John Roan is very low. Bart Dills is tolerable well. Lieut. Enlow is very bad off. The measels is in our camps. Several of the men has got them and I am afraid they will do bad work in the company. So I will conclude for this time. Do the best you can. Take good care of the children and remember me. So I am your best friend and lover until death. So Good bye. I take the opportunity of writing you a few lines and I am glad to tell you that I am well and willing to indulge the fond hope that my letter will find you all well. This is five letters that I have wrote to you and has not got but one. Ben Carpenter brought me a letter last Friday night and I was glad to hear from you and hear that you was all well but how much gladder would I be to see you for I cannot write myself no way. I never have been half as bad dissatisfied as I am now and no hopes of getting homeany time soon but there is a day acoming when if I live I can go home and see you and stay there in peace and maybe not suffer as much with hunger as I do here. I hate to tell you how I live here but to not tell you will not make the matter any better nor any worse. We get a pound of flour a day and a half pound of bacon to a man 5 days and if that ain't hard times I don't know what is. We can't live on that and nothing but we have to drill 6 hours every day only when we are at hard work. We are digging trenches to stand in to fight and I can't hold up without I could get something to eat now. I won't try too many weeks longer. (The woods will be green after a while). I have no news to tell you. We get no news that is worth any attention. I hear no talk of the Yankees coming and they do come we are ready for them if they out number us too much but I don't wish to go in the fight with a empty belly. (And that ain't all). Last Sunday the troops at Knoxville heard that we (were) fighting here and forces of 5 thousand came to help us and stayed all night and went back next morning without any fight. I suppose the Yankees had started here and the forces up about the saltworks give them a fight and killed 150 of them and the rest went back and I don't care if they stay back. The health of the company is a little better than it was when I wrote last. There is only about 10 or 15 that is not able for duty. I want you to sorter spur up and write to me oftener than you do. I don't want to write 5 letters to your one all the time. You must write as often as I do and that will be once every week. You need not send me any ink. I have got some. I will quit writing till next Tuesday and then I will finish my letter and it maybe that I will have some news by that time if I don't perish before then. Captain Henry says when he gets well we shall have enough to eat or go home one. I am well this morning and have concluded to finish my letter for tomorrow I will have to work and won't get time to write any. There is no small pox in our regiment as I know of. The regiment is not all here. There is only 4 companies here. Ed Roane is talking of going home in a few days and if he does I will send you some money and if I send it I want it put of as soon as it can for in a month or two it will be of no use. It is all called in and if it is not returned to the bank the first day of July is dead. And if you can't buy corn with it I think I had better buy that land for John for it will be of some use and the money will not and so I think I had better trade for the land and I will write a note and send and if you can't get corn for the money have John to give a bond for the land and you pay him 25 dollars down and the rest of the money put on my Jack Johnson and Don Leyle note. It is a hard matter to pass a confederate bill now. The money is 7 percent under repair. I think I have wrote enough without I had some news to write. I do my own washing for I can't get it done for less than 25 cts a garment and I don't want to pay that much. Write as soon and often as you can. So nothing more only I remain your best friend. $50. 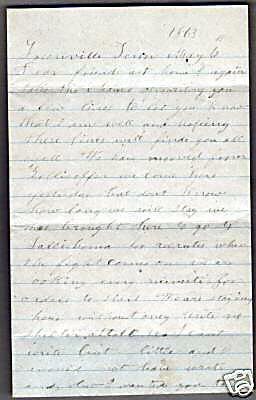 One day after date I promise to pay John A. Cloer the sum of fifty dollars for value received of him. Witness my hand and seal this the 27th day of April 1863. Understand me plain. Don't pay out any money if you can corn with it or buy thread with it. Ump sends his respects to you all. I want to see you all and particular the children. I got a letter from Nick. They was all in common health the 17th of April. I again take the chance of writing you a few lines to let you know that I am well and hoping these lines will find you all well. We have moved from Zollicoffer. We came here yesterday but don't know how long we will stay. We was brought here to go to Tallihoma for recruiter when the fight comes on. We are looking every minute for orders to start. We are staying here without any tents or shelter at all. I can't write but a little and I would not have wrote any but I wanted you to know where I was and what the prospect is. We left Ump and Mont Ledford and several others in the hospital at Zollicoffer. Ump was very bad off. I don't hardly think he will live. You need not write any more til you hear from me again for there is no telling where we will be after this time. If we are not called to go to Tallihoma we will go back to Zollicoffer. I would be glad if I could hear from you but the chance is bad now. 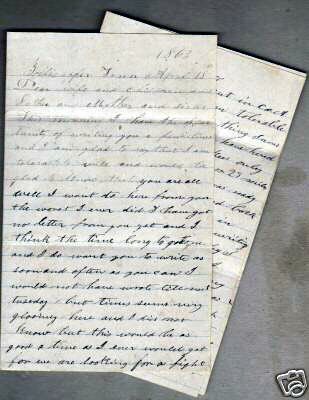 I have not got but one letter by mail from you and one by hand of B. Carpenter and I wish I could get one every day. We will not stay here more than a day or two. So I will have to quit writing and go on guard. I will write when we move if I have the chance. So nothing more only I am your best friend. Goodbye . Do the best you can. I wish I could write more but I can't this time. I again take the opportunity of writing you a few lines and I can tell you that I am well and hoping these lines will find you all in good health. I have nothing new to write only we are going back to Zollicoffer. We started yesterday and could not get all our things in the car and 12 of us stayed to guard them and the rest of the company went on and we will go this evening and I expect we will stay there. Us having to move is why I am writing so soon. I wanted you to know where I am. I will get to Zollicoffer at 6 o'clock this evening and yoou can direct your letters [to] Zollicoffer and not to Greenville and write just as soon as you can. I got a letter yesterday from you, the second letter I have got since I left home. I don't know what I will [do] about writing for I have got just one more sheet of paper and I borrowed this that I am writing on and I tried in every store in Greenville and could get no paper. 4 of our boys left us yesterday and is on their way home. Dock Mahaffey, Gill Hure, Les Boston and Till Rabey cut out for home and they are not all that will go. So I think I have wrote enough for this time. Write as soon as you can and often. You can tell John Hopkins's wife that he is not well. He has got the measels and if she has got no letters from him it is not his fault for he writes every week. So I will conclude for this time by saying I still remain your best friend. Write as soon as you can. Stonewall Jackson is dead. He was shot in a mistake by one of Longstreet's men. I now take the opportunity of writing you a few lines and as you read them you will find that I am well and truly hoping that my letter will find you all well. I have nothing new to write to you. We get no news here. I am sorry to tell you that Mont Ledford is lying very low. I don't think he can live very long. He is as low as anybody can be alive but yet he may recover. I want to see you and my babies the worst I ever did and think the time very long to go home and I am so lonesome I can hardly live but there is company plenty here but they do me no good. It is not like being at home and if I never go home til the war ends I will not go in several years. 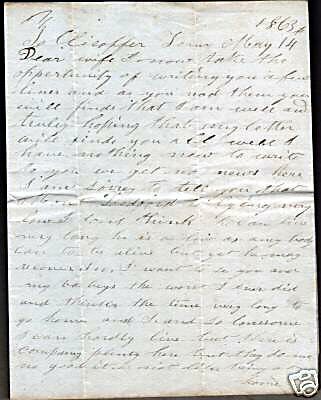 I have not got but two letters from you since I left home and I was glad of them but if I could see you all I would be better satisfied than I would be to get as many letters as I could carry in my knapsack and I think I will see you some time and maybe unexpected things will happen sometimes. I will just tell you that Mark Kelley is under arrest and I expect he will be put out of office. There is a good deal of sickness in our company. Ump is mending very well. I think he will be well in a few days. He sends his respects to you and all. I would not have wrote so soon after writing at Greenville on the 11th of May but I wanted to tell you to be sure and not write to me anymore til you hear from me again and I don't know when that will be but don't you start nary another letter to me til you hear from me. Strange things will happen sometimes. I will let you know where to write and if you don't hear from me anymore in 2 or 3 months, you need not be uneasy about me for some will happen that many people is not looking for. Men will see their wives hwn other men is not thinking of such a thing and I would like very well to see you and somebody will be disappointed before many years rolls off. I can't say who it will be. I think I have wrote enough this time and I don't know when I will write again but it may be a long time and it may be before very long. So I will conclude writing for this time and wish you just as well as I can. So nothing more this time only I remain your best friend and lover until death. I will tell you again don't write to me anymore til you hear from me again and you shall hear as soon as necessary or as soon as everything comes right or wrong, one or the other. Recommended Reading: The Life of Johnny Reb: The Common Soldier of the Confederacy (444 pages) (Louisiana State University Press) (Updated edition: November 2007) Description: The Life of Johnny Reb does not merely describe the battles and skirmishes fought by the Confederate foot soldier. Rather, it provides an intimate history of a soldier's daily life--the songs he sang, the foods he ate, the hopes and fears he experienced, the reasons he fought. Wiley examined countless letters, diaries, newspaper accounts, and official records to construct this frequently poignant, sometimes humorous account of the life of Johnny Reb. In a new foreword for this updated edition, Civil War expert James I. Robertson, Jr., explores the exemplary career of Bell Irvin Wiley, who championed the common folk, whom he saw as ensnared in the great conflict of the 1860s. Continued below. 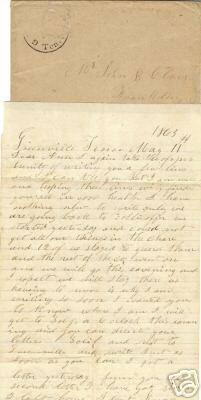 Recommended Reading: The Civil War in North Carolina: Soldiers' and Civilians' Letters and Diaries, 1861-1865. Volume 2: The Mountains (Civil War in North Carolina) (Hardcover). 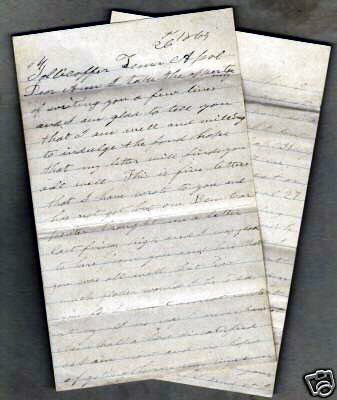 Description: As with The Civil War in North Carolina: Soldiers' and Civilians' Letters and Diaries, 1861-1865. Vol. 1: The Piedmont, this work presents letters and diary entries (and a few other documents) that tell the experiences of soldiers and civilians from the mountain counties of North Carolina during the Civil War. The counties included are Alleghany, Ashe, Buncombe, Burke, Caldwell, Cherokee, Clay, Haywood, Henderson, Jackson, McDowell, Macon, Madison, Mitchell, Polk, Rutherford, Surry, Transylvania, Watauga, Wilkes, and Yancey. The book is arranged chronologically, 1861 through 1865. Before each letter or diary entry, background information is provided about the writer. Continued below. The Civil War in North Carolina: Soldiers' and Civilians' Letters and Diaries, 1861-1865 (Volume 2): The Mountains, is the soldier's story. It is an A-to-Z compilation of what the "rank and file soldier" experienced during the American Civil War. The Western North Carolina soldiers express their hearts to their loved ones and friends, thus allowing the reader the most intimate and personal view of the war. From triumph to tragedy, the "soldiers' letters" express what few authors or writers can achieve--realism. According to cartographic and demographic studies, Southern Appalachia comprised a unique indigenous people, and by isolating these rare letters it allows the reader the most detailed insight to their experiences. The soldier experienced various traumatic stressors in the conflict: such as witnessing death or dismemberment, handling dead bodies, traumatic loss of comrades, realizing imminent death, killing others and being helpless to prevent others' deaths. Plain, raw and to the point: The reader will witness the most detailed insight to the so-called American Civil War. Intimate and personal: diseases, privation, wounds, loneliness, exhaustion, heartache, and death are all explored. This book includes a lot of information about: Western North Carolina Civil War History (North Carolina mountain troops), soldiers' photos (some tintype photographs too), and rare pictures. For example, on page 143, there is a photo of Gov. Zeb Vance's brother, Robert, at Fort Delaware Prisoner of War Camp; he had been captured by Pennsylvania cavalry in East Tennessee. You may even see a rare photo or letter of an ancestor. The maps, which reflect the region, have keys which place each regiment to each western county (where the troops were raised). The soldiers - collectively - also present a detailed North Carolina Civil War History. By reading the letters, you will easily form a timeline that is filled with first-hand facts. To be very candid, it is not only filled with primary accounts of the war, but it is one of the best books to read about the war...Creates an indispensable historical timeline of events of the brave men from the Old North State. From Publishers Weekly: William Fletcher joined the Confederate Army in 1861. He served with the Army of Northern Virginia's elite Texas Brigade until the Battle of Chickamauga. Unable to march because of wounds, he transferred to the cavalry and finished the war with the Texas Rangers, then wrote his memoirs 40 years later. Most of the original copies were destroyed in a fire. The current edition presents unvarnished images of hard marches, short rations and battles in which being wounded could prove worse than being killed. Fletcher describes the horrors of being a Civil War casualty as vividly as any firsthand account from either side. The author emerges from these pages as fighting less for a cause than for his own pride in being a good soldier. His narrative does more than many learned monographs to explain the Confederacy's long endurance against overwhelming odds. Customer's Review: I bought this book when I hadn't yet done any research at all about my family history. A year and a half later, I have a file drawer full of information, and I have needed no other reference. I also bought a book called "The Source", which is supposed to be the 'genealogist's bible', and it has been a giant paperweight in comparison. Idiot's genealogy is full of the kind of practical information that can carry you through years of research. Happy hunting!!! Recommended Reading: The Soldier's View: The Civil War Art of Keith Rocco (Hardcover). Description: A splendid collection of more than 100 paintings and sketches from one of the leading artists working in the Civil War field. The text features carefully selected eye-witness accounts that accompany the paintings, and the result is a moving ensemble of images and words that pays homage to the common soldier. Rocco's oils are reproduced here on acid-free, heavy art paper and placed in a finely sewn binding. "This art is more graphic than the most gripping Civil War photo or picture that I have ever viewed."